1. For the nam jim, put the coriander stalks, ginger, garlic and chilli into a small food processor and whizz until very finely chopped. Add the sugar, fish sauce and lime juice; whizz again to combine. Adjust the seasoning with a little more sugar or fish sauce, if needed. 2. Heat a griddle pan over a high heat then coat the cabbage quarters in the olive oil and season. Put on the hot griddle pan, reduce the heat to medium, cover with a lid or a sheet of foil and cook for 4-5 minutes on all three sides, until charred and tender. 3. 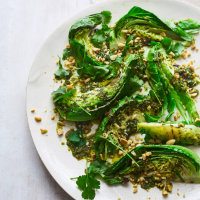 Serve the cabbage drizzled with the nam jim sauce and scattered with the peanuts and coriander leaves. This makes a delicious meal with steamed white fish and jasmine rice.